When I trained for and ran my first six marathons, I exclusively used GU for fuel. It tasted fine and usually didn’t upset my stomach. Then, in the midst of training for marathon #7, my body decided it didn’t like GU any longer. Taking even half of one started making me nauseous and gaggy (that’s a word) — not how I wanted to feel in the middle of a training run or, especially, a race. As the race approached, I went on a desperate quest to find new fuel. I tried Hammer, and Powerbar, and Clif chews, and several others, but nothing seemed to work. (Now I know that I was also dealing with IBS, which certainly didn’t help anything and ended up ruining my race anyway). Then one day, Jordan went to a running store and came home with little silver packets labelled “VFuel.” A love affair was born. Disclaimer: VFuel isn’t sponsoring this post or compensating me in any way. I’m sure the company doesn’t even know I exist. I’m just thrilled to have finally found a gel that works for my freaky guts, and I wanted to spread the word. Also, all the images in this post are borrowed from VFuel’s website. 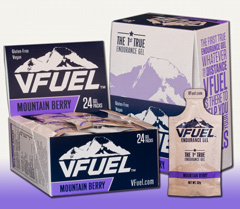 VFuel is a Colorado company, started by ultra runners in Estes Park, so before I’d even tried the product, I liked that aspect, at least. Then I tried the gel and used it in my training, and now I’ve determined that it’s the best gel on the market, especially for those of us with sensitive stomachs. As I mentioned earlier, I’ve recently been diagnosed with IBS, and I’m learning about how different sugars affect my system. Fructose is hard for me to digest, and, as it turns out, is also hard for many people to digest, not just those with IBS –and especially while participating in endurance activities. The makers of VFuel know this, so they don’t use fructose in their gels, instead using dextrose and other easily-digestible ingredients. Knowing that VFuel is easy on the GI system is a major selling point for me, but the taste of the gels is important, too: I don’t want to be gagging while trying to take in fuel. VFuel also delivers on the taste front. My favorite flavor is the Mountain Berry, but they’re all pretty tasty (except the Maple Bacon. Meat-flavor ranks pretty high on my list of things I don’t want on a run. But if that’s what you’re in to, go for it). Though I’d never heard of VFuel until last summer, I was late to the party: several of my favorite athletes are featured on VFuel’s website. 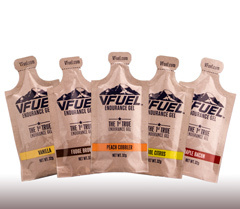 Folks like Sage Canaday, Timothy Olson, Reese Ruland, and other total badass ultrarunners are apparently VFuel users. Of course, that’s not why I use VFuel, but I’m going to pretend that it will make me wicked-fast and tough like those guys. VFuel is, by far, the best gel I’ve tried, and the only one that doesn’t upset my stomach. I’ve used it on numerous runs this training cycle, and it’s never made me nauseous or worse. I highly recommend it, especially if you, too, have a sensitive stomach. Go check it out! Have you ever tried VFuel? Which athlete most inspires you? Yeah, give it a try! I really like it (obviously 😛 ). Yeah, the maple bacon is definitely NOT my thing. I’ve never heard of Humagel. Never heard of it! But I’m interested! I use Vega gels and bars plus ProBar chews. But I’m always looking for new stuff to try. I didn’t even know Vega made gels! I love their protein powder. Oh, these sound interesting. I just got into GU with the last marathon after being an exclusive chomps girl. How does Vfuel compare to honey stingers? Honeystinger really upset my stomach… and now my RD says not to eat honey. I guess that makes sense, then. 🙂 I thought they were too sweet, anyway… I prefer a gel that goes down quick and has a taste that’s easy to wash away.